Why? Because some religion enthusiasts ram into pedestrians. Can you guess the religion? 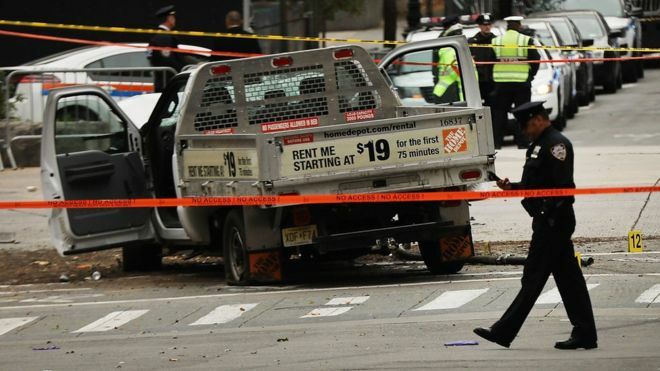 On Halloween, a terror-related vehicle attack killed eight in the city's Lower Manhattan. 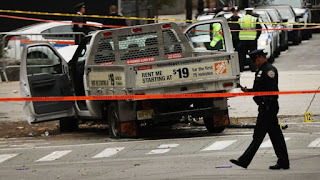 The mayor of New York City has announced plans to install 1,500 steel street barriers to prevent vehicle attacks. Bill de Blasio said the protective barriers were part of a $50m (£37m) investment in security infrastructure. The move comes after two vehicle attacks in 2017 that killed nine people in total. The new permanent barriers will replace temporary concrete blocks that were put in place after the incidents. "I want to tell you these are the most cowardly kind of attacks - when someone with a vehicle ploughs into a group of innocent pedestrians. It's disgusting," Mr Blasio said at a press conference in Times Square, near where one of the vehicle attacks took place. "But we know there are some out there who mean to do us evil and we will protect against it." Last Halloween, a 29-year-old man drove his truck into people on a cycle path in Lower Manhattan, killing eight people and injuring 11. In May, another driver rammed his vehicle into the crowds on sidewalks in Times Square, killing a 18-year-old and injuring a further 20 people. Temporary concrete blocks were installed in Times Square and Lower Manhattan in the last few months following the attacks in the city and others worldwide. "That was necessary to immediately secure those areas in light on these new trends we've seen," Mr Blasio said. "But we knew we needed long-term solutions, we needed permanent barriers."